DREAM IT. DO IT. RIDE IT. For some people, a globe or a map isn’t some route-finding device. It’s a menu. Of all the places they can go, the things to see, the adventures to savor. But unless you plan on walking, you need a way to get there. 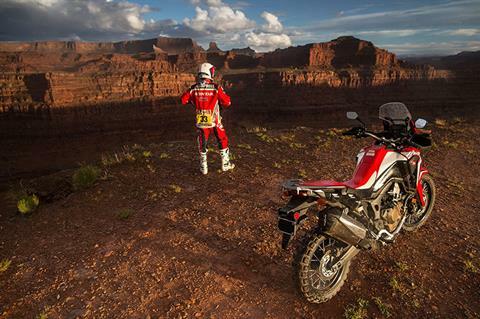 And that’s why we build the Africa Twin®. The perfect travelling companion for the explorer in you, whether it’s a weekend, a month, or a lifetime. Where will it take you? Let’s look at that map. RALLY WINDSCREEN - Developed from our racing experience in the Dakar Rally, the Africa Twin’s windscreen helps shield you from the wind and the elements, especially during long miles of high-speed touring. At lower speeds, the clear construction gives you better visibility off road. 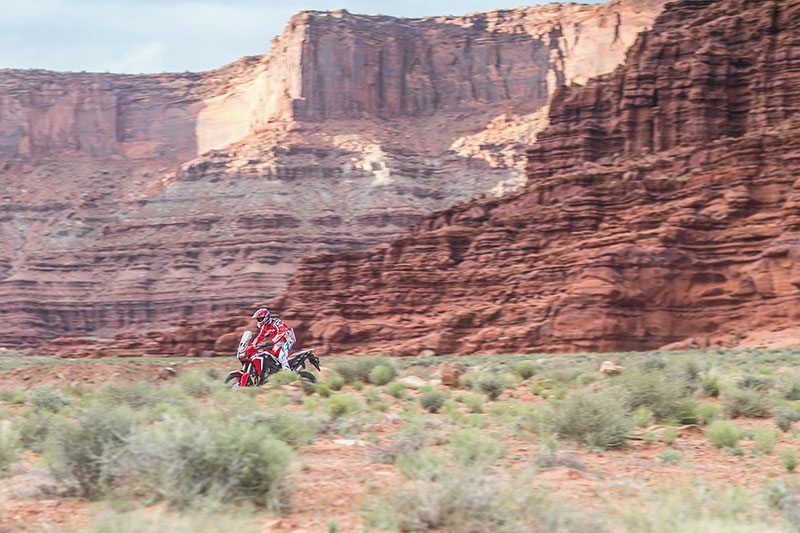 NARROW RIDING POSITION - Adventure riding is an active sport, and that means you need to be able to move around on your bike naturally and athletically. 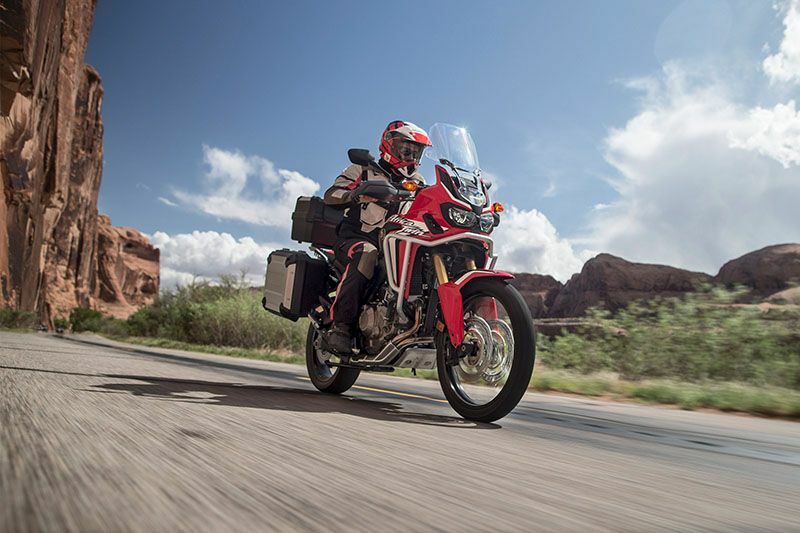 The Africa Twin is extremely narrow where you sit, and the peg-bar-seat triangle lets you move up and forward and far back as well, to enhance handling, especially under demanding trail conditions. ADJUSTABLE SEAT - The Africa Twin offers an adjustable rider’s seat. This makes reaching the ground easier, and also lets you fine-tune your riding position in respect to the footpeg and handlebar placement. BIAXIAL COUNTERBALANCE - By using counterbalancing elements on two axes, Honda’s engineers can cancel out both primary and coupling vibrations from the engine. The result is that we can mount the engine solidly for superior strength and handling, yet you still get an extraordinarily smooth, vibration-free ride. 43-DEGREE STEERING LOCK - With 43 degrees of steering lock both left and right, the Africa Twin provides excellent maneuverability on tight trails. This is one of the reasons the Africa Twin feels so much more nimble than many of the other bigger adventure bikes out there. 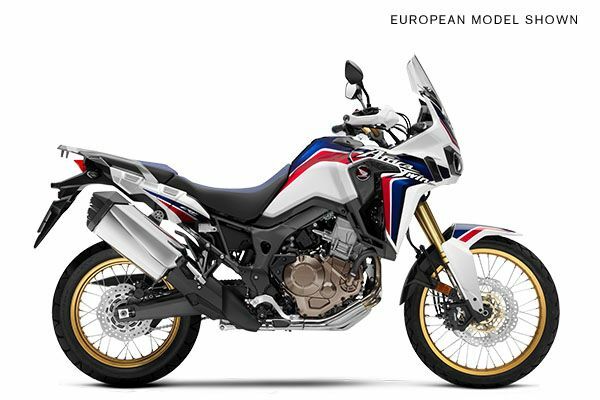 SEMI-DOUBLE-CRADLE FRAME - The Africa Twin’s semi-double-cradle frame layout has been proven in countless Honda dirtbikes. In principle it’s similar to the design we use on our CRF450R Rally bike—a machine that’s designed to perform in the challenging Dakar rally and similar events. FRONT SUSPENSION - The Africa Twin uses a specially built inverted Showa fork with huge 45mm fork tubes and 9.0 inches of travel. It’s fully adjustable for both compression and rebound damping. REAR SUSPENSION - Not only is the Africa Twin’s rear suspension fully adjustable, it offers a 220mm stroke for 8.7 inches of rear-wheel travel. Even better, there’s a special remote preload adjuster—you just turn a convenient knob, and you can compensate for varying loads like a passenger or full panniers. PRO-LINK REAR SUSPENSION - We worked hard to tuck the Africa Twin’s Pro-Link rear suspension linkage up away from harm. The rising-rate design resists bottoming, yet gives you a plush ride over small bumps. 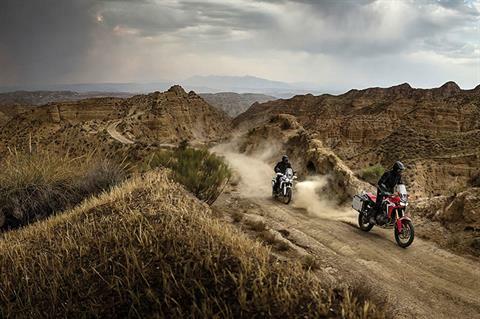 LONG TRAVEL SUSPENSION - The Africa Twin doesn't just look like an adventure bike - it's the real deal. Exhibit A: Check out its long-travel suspension. The fork features huge 45mm tubes and 9.0 inches of travel, while the single-shock rear suspension is also fully adjustable, with 8.7 inches of travel and a convenient remote preload adjustment. HOLLOW AXLE SHAFTS - The Africa Twin uses large-diameter hollow steel axles front and rear. They’re super strong, durable, but also light: a combination which describes just about everything associated with this bike. HONDA SELECTIVE TORQUE CONTROL - Dial in exactly the kind of power delivery you want for the conditions at hand. 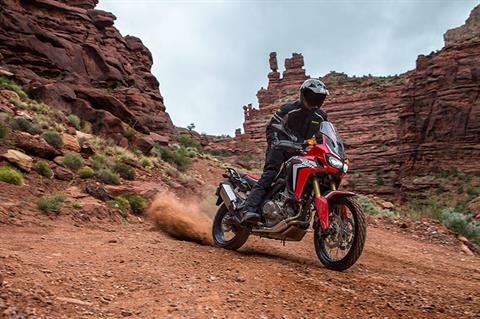 The Honda Selective Torque Control (HSTC) features three settings for a wide range of conditions, from pavement to fast, loose fire-roads to challenging singletrack. You can also turn it off. 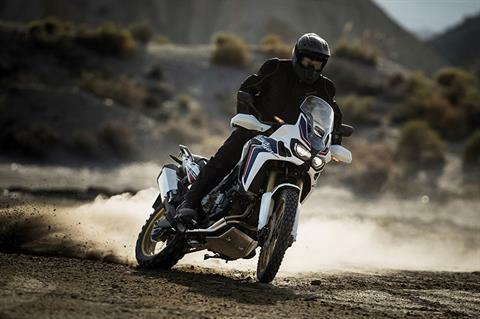 PARALLEL-TWIN ENGINE LAYOUT - The Africa Twin’s parallel-twin engine layout makes the bike shorter front-to-back. That means the front wheel can tuck in closer to the engine, shortening wheelbase and making the bike more nimble off road and on pavement. TAPERED ALUMINUM HANDLEBAR - Another example of fitting premium equipment to the Africa Twin wherever we can, the aluminum handlebar is much lighter than a steel unit. The design tapers from a thinner diameter under your grips to a fatter section at the bar-top clamp, and is fine-tuned for optimal flex and rigidity. TIRES AND WHEELS - Real adventure bikes use spoked wheels because they better survive the dings and hits of off-road riding. The Africa Twin uses a 21-inch front and an 18-inch rear for superior performance, especially when it comes to off-road riding. BRAKES - With a pair of 310mm wave-rotor front disc brakes and a single 256mm wave disc in the rear, the Africa Twin offers up ample stopping power in all conditions. FOUR-PISTON CALIPERS - Up front, the Africa Twin features twin four-piston brake calipers for powerful braking performance. The radial-mount design also helps make them stiffer, increasing brake feel and control. UNICAM ENGINE DESIGN - Honda’s exclusive Unicam® engine design helps us give the Africa Twin a compact cylinder head for optimal engine placement. But the engine also benefits from superior performance, thanks to the entire cylinder-head layout. It’s the best of both worlds! TWIN INTAKES - The Africa Twin uses a unique twin air-intake design with twin vertical filtration elements. This gives you excellent engine performance with plenty of clean air, even under dusty conditions.